CAP analysis showing total human modified area in 2011 and average rate of change from 2001–2011. Conservation Science Partners, “Description of the approach, data, and analytical methods used to estimate natural land loss in the western U.S.” (2016), unpublished technical report, available here. Natural areas in the West are going fast. With each flight home, we get a bird’s eye view of sprawling new roads, oil wells, and pipelines. The Oregon woods we explored as kids are now stumps without songbirds. We see fewer stars through Santa Fe’s brightening lights. Yet, from governors’ mansions to the halls of Congress, questions about land and wildlife conservation command relatively little attention today. The conventional wisdom seems to hold that the most consequential battles over America’s wild places are already settled. President Theodore Roosevelt, Sierra Club founder John Muir, and the environmental activists of the 1960s won protections for national parks, national forests, and wilderness areas. In the eyes of some politicians, the West’s open spaces are not only well protected, but too well protected. An anti-parks caucus in the U.S. Congress, for example, wants to block new national parks and sell off the West’s national forests to private owners. How fast is the United States losing natural areas in the West and—importantly—why? This project seeks to answer these questions, with the help of some of the country’s top researchers in landscape ecology and conservation biology. A team of scientists at the nonprofit Conservation Science Partners, or CSP, analyzed nearly three dozen datasets; a dozen types of human activities; and more than a decade of satellite imagery for 11 western states: Arizona, California, Colorado, Idaho, Montana, Nevada, New Mexico, Oregon, Utah, Washington, and Wyoming. Here is what they found: Human development in the West now covers more than 165,000 square miles of land. That is roughly the size of 6 million superstore parking lots. This development is growing fast. Between 2001 and 2011, natural areas in the West—including forests, wetlands, deserts, and grasslands—were disappearing at the rate of one football field every 2.5 minutes. This site presents our findings, which we hope will inform and inspire your efforts to protect the lands, waters, and wildlife that make the West so special. We invite you to explore the map; examine the trends; listen to the stories of those who are affected by these changes; and share your experiences and perspective. Never before has the public had so much access to information about the condition and uses of America’s lands. Publicly available datasets document the locations of everything from transportation and energy infrastructure to commercial and residential construction. Satellites have collected a multidecadal public library of imagery of the Earth’s surface. These datasets tell stories of change. At the broadest level, we found that between 2001 and 2011, approximately 4,300 square miles of natural areas in the West disappeared because of development—that loss amounts to an area bigger than Yellowstone National Park. Among the 11 states that CSP studied, Wyoming and Utah experienced the largest percent change in area modified by human development between 2001 and 2011. Development on private lands accounted for nearly three-fourths of all natural areas in the West that disappeared between 2001 and 2011. State lands—many of which are managed primarily for energy and timber extraction—also lost wide swaths of land to development. Natural areas on U.S. public lands fared comparatively better than state lands, with national parks having the lowest proportion of land conversion among all ownership categories. But which human activities are actually causing these changes? 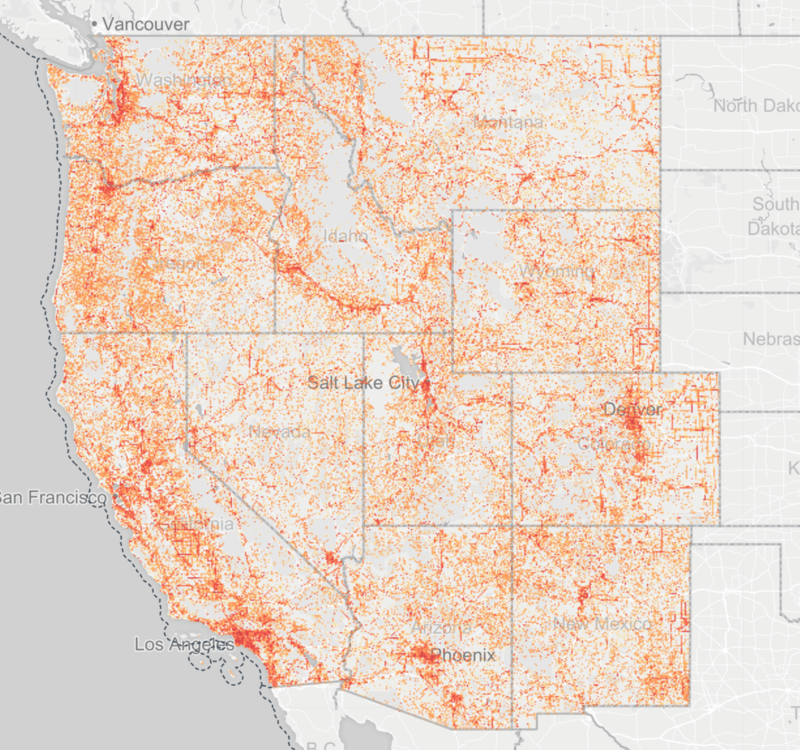 Of the four categories of land use stressors that CSP analyzed, agricultural and forestry operations occupy the largest footprint of land in the West. Yet, with the exception of logging activities in the Northwest, agriculture and forestry caused only marginal new loss of natural areas in recent years. The sprawl of housing and commercial buildings, on the other hand, accounted for more than half of all open space that was lost between 2001 and 2011. The footprint of western cities and towns grew nearly 17 percent in this period, with the fastest growth occurring in Arizona, Colorado, Nevada, and Utah. Oil, gas, coal, and other energy and mineral development was the second-largest driver of natural area loss between 2001 and 2011—behind urban sprawl. In this period, the footprint of energy infrastructure in Colorado, Wyoming, and Utah grew by nearly one-third as oil and gas drilling exploded near towns like Pinedale, Wyoming, and Rifle, Colorado. Meanwhile, the transportation sector—including roads and transmission lines—has expanded rapidly and further extended its reach into previously roadless areas. Across the West, patterns of development are carving natural landscapes into smaller and smaller areas. This process, called fragmentation, has severe consequences for the movement and survival of wildlife and the provision of clean water. Fragmentation has become so severe and widespread that a bear walking a random path through natural areas in the West is an average of only 3.5 miles from significant human development. In a region whose way of life is rooted in the outdoors, the rapid loss of natural areas is disrupting and displacing individuals and communities. In Rosebud, Montana, for example, Wally McRae has fought for decades to save his ranch from the reach of the neighboring coal industry. The disappearance of the West’s natural areas, of course, affects not only its people, but entire ecosystems. In California alone, more than 300 plant and animal species are at or near the brink of extinction. And although the Endangered Species Act, or ESA, has been a lifeline for mammals like the gray wolf and the grizzly bear, dozens more western wildlife species are in decline. According to data compiled in the IUCN, or International Union for Conservation of Nature, Red List, the populations of more than 40 percent of snakes, lizards, and other reptiles in the West, for example, are decreasing. The reality is that, without adequate protections for their habitat, a growing proportion of western wildlife will need the legal protections of the ESA to survive. And without protections for habitat, the continued collapse of wildlife populations will have profound human and economic consequences. In Oregon, Rebecca Miles recalled the once abundant salmon runs on the Snake River. 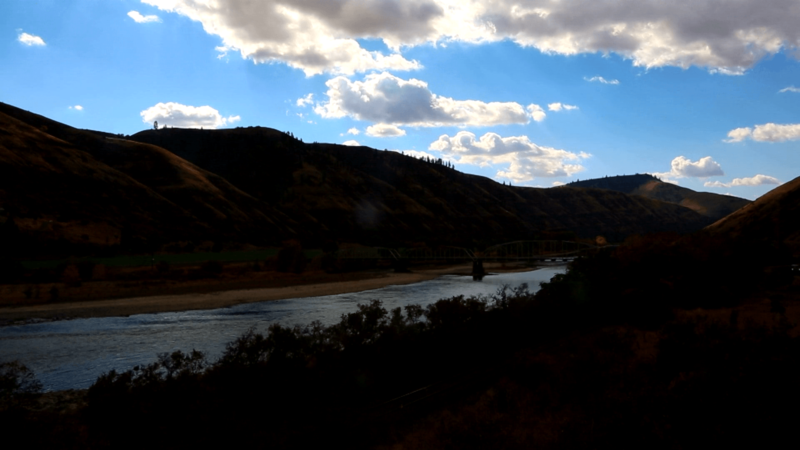 Today, the Nez Perce dream of letting the river and its fish run free again. Conservation Science Partners’ data and analysis for this Disappearing West project—and the illustration and animation by Gage Cartographics—help us understand what we are losing and how fast we are losing it. But they also tell us what we have saved and how we might save more. Thanks to conservation efforts from determined and impassioned citizens across generations, as well as officials at every level of government, the West is still home to some of the world’s most wild and wondrous places—including the Crown of the Continent in Montana; the Sierra Nevada mountain range in California; the Olympic Peninsula in Washington; the Bitterroot Mountains in Idaho; and the Greater Yellowstone Ecosystem in Wyoming, Montana, and Idaho. However, the protections that these places enjoy as wilderness areas, national parks, and through conservation easements are the exception, not the rule. The ecologist E.O. Wilson argues that half of the planet’s lands and waters should be set aside for the benefit of wildlife and natural systems. Wilson estimates that by doing so, 84 percent of Earth’s plant and animal species could be saved from extinction. In the West—and indeed across the United States—we are nowhere close to meeting Wilson’s goal. Only 13.7 percent of U.S. lands and waters qualify as protected, according to the standards maintained by the IUCN. Despite the bombastic assertions of some politicians that the West is “locked up” and “off limits” to mining, drilling, and logging, only 12 percent of lands in the West are actually protected from development. Of the more than 250 million acres of land overseen by the U.S. Bureau of Land Management in western states, the oil and gas industry can drill on 9 out of 10 acres. The good news is that, although natural areas in the West are disappearing quickly, there are still opportunities to protect what is left. Private landowners and land trusts can help safeguard remaining natural areas through conservation easements and wise agricultural practices. Cities can minimize their footprint and expand outdoor recreation opportunities by refining their plans for smart growth. States can establish permanent funding streams for the protection of open space and wildlife habitat. And both state and national land management agencies can guide energy development, logging, transportation, and mining to places with the fewest conflicts. Theodore Roosevelt and John Muir fought for the principle that some wild places should be permanently set aside for future generations. “Leave it as it is,” said Roosevelt about the Grand Canyon. “You cannot improve on it. The ages have been at work on it, and man can only mar it." More than a century later, this conservation idea remains indispensable to the preservation of the West’s character and to the health and prosperity of its communities. By permanently protecting more of the West’s public lands as wilderness, national parks, and monuments, the nation can collectively make progress toward protecting large, contiguous, and ecologically healthy landscapes across the region. This task of protecting the West’s last, best natural areas will require a renewal of the same urgency that moved earlier generations to save places like the Muir Woods National Monument and Canyonlands National Park. But today’s growing movement for land conservation is also rightly being reimagined for the values, tools, and challenges of the present. Maite Arce—president and CEO of the Hispanic Access Foundation—is just one example of a contemporary leader in conservation whose work to strengthen and highlight connections to the outdoors is helping inspire a new generation of conservation leaders. Arce and other leaders in the growing conservation movement are taking advantage of an ever-expanding set of tools that give us all an unprecedented ability to communicate, organize, and advocate for the places we love. This website and the Disappearing West map is one such platform. We hope you find these tools helpful; we would love to get your feedback. Please explore the Disappearing West map, share your perspective, tell us what new data you’d like to see, and, importantly, invite others to join the project. We will be adding analysis and stories to this site over the coming weeks and months, so please come back soon! Produced by Nicole Gentile; narrative and analysis by Matt Lee-Ashley, Jenny Rowland, Mary Ellen Kustin, and Nicole Gentile; video by Andrew Satter; web design and development by Andrew Lomax; editing by Victoria Ford and Emily Haynes; additional thanks to Lauren Vicary, John Hanly, and Pete Morelewicz. Data and analysis by David M. Theobald, Luke J. Zachmann, Brett G. Dickson, Miranda E. Gray, Christine M. Albano, Vincent Landau, and Dylan Harrison-Atlas.